NYK Component Solutions is a specialised distributor of connectors, with a focus on providing interconnect solutions to address the most demanding environmental, physical and electronic demands. NYK represent IEH Corporation, the premier designer and OEM of hyperboloid contact technology interconnects. Here, NYKCS interviews Dave Offerman from IEH Corporation about hyperboloid contact technology and when we should consider using it. Many harsh environment interconnect problems can be addressed by employing the use of military specified connectors which are field proven and naturally meet many of the extreme condition demands in commercial market sectors. This is normally achieved by heavy duty coupling systems and bodies constructed and appropriately plated to withstand harsh environments. A whole range of variants has evolved specifically for the harsh commercial market sector, these often feature commercially acceptable nickel plating rather than military market norms such as cadmium. These rugged bodies, plating, insulators and couplings are all designed to protect the contacts from the external environment of heat, chemicals, and pressure. But sometimes, as is the case with extreme shock and vibration, the contacts need to deliver ensured signal stability without reliance on packaging protection. It is in these circumstances that the end user should take into consideration the design and benefits of the contacts within the connector. 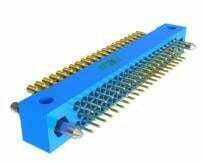 We may have to consider in such extreme circumstances moving away from traditional pin and socket designs and exploit a connector with a contact specifically designed to withstand the most extreme physical demands. Inherent in its design and construction the hyperboloid contact is one of the most mechanically tolerant designs, they are therefore suitable for applications where electronic signal integrity needs to be ensured under severe shock and vibration. In use for over 40 years under the most demanding conditions, IEH’s Hyperboloid technology has proven itself to be the leading design for integrity and reliability. On avionics platforms, military and commercial aerospace equipment, engine control systems, missiles and torpedo’s, vehicular electronics, satellites and rocket launchers, medical devices, industrial and environmental controls, test equipment, PGA sockets and countless other rugged applications, IEH’s Hyperboloid connectors and contacts have lived up to their promise of the highest reliability connections available. The Hyperboloid contact is an advanced design that satisfies performance requirements previously considered impossible. Unique in concept, it is employed in connectors having the highest standards of performance. The distinguishing feature of the socket is the hyperboloid-shaped sleeve formed by straight wires strung at an angle to the longitudinal axis. When the pin is inserted into this sleeve, the wires stretch, well within elastic limits, to accommodate it. In so doing, the wires wrap themselves around the pin providing a number of continuous line contact paths. Immunity to Shock & Vibration. The low mass and resulting low inertia of the wires allows them to follow the most extreme excursions of the pin without loss of contact. Tests exceed 300 g’s without discontinuity. 100,000+ Mating Cycles. The burnishing action of the wires on the pin surface is non-destructive. Unlike the “plow and scrape” action of common designs, Hyperboloid’s gentle mating action enhances life. Improved Current Carrying Capacity. The low contact resistance gives a lower °C rise from ambient under load. This feature often allows you to operate the same size contact under higher load. Low Contact Resistance. The multiplicity of line contact, as opposed to point contact in other designs, provides an excellent interface exhibiting low contact resistance (often less than ½ of Mil-Spec. allowances). This characteristic also provides for a cooler running contact under load. IEH also provides Hyperboloid Power Contacts, for applications which require more current through a smaller interface, at lower ambient temperature rises. Our Contacts Catalogue offers a representative sampling of the many different mating diameters and termination styles we’ve produced for military, commercial aerospace, space, medical and industrial high-power applications. 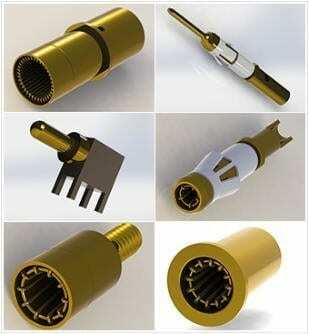 In addition, we provide Customized Connectors, all employing the Hyperboloid contact, and our engineering team is happy to design and build a connector to your specific requirements. IEH’s Value-Added Services include complete Flex and Cable Assemblies. For Flex, IEH Engineering will work with you on the design and layout of your flex, source it, and terminate it to the IEH connector. Cable terminations can be provided as well. 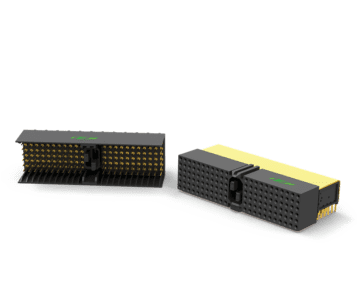 The result is a more Comprehensive, Cost-Effective Interconnect Solution. Most recently, IEH now employs our Hyperboloid contacts in High-Speed connectors. In both cPCI and VITA packaging, IEH’s hyperboloid connectors can now be used in high-speed, high-data transfer applications with speeds up to 10 Gbps. These connectors can be supplied in 3U, 6U and Custom Configurations, with Custom Wafer Design for Mixing Differential and Single-ended Circuits, with Ruggedized Chassis and either press-fit or solder terminations. For the harshest environments on Earth or beyond, you will not find a more durable, rugged, or reliable connector. 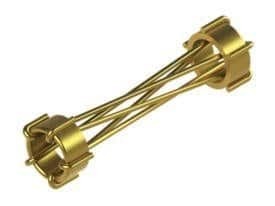 IEH hyperboloid connectors for superior performance in all applications.